I have found some crazy things on eBay, but when I saw a jet engine I had to at least make a bid. Lucky/unfortunately, I won. If you were watching the SFE_Engineering twitter feed, you saw this photo with the caption, "NERDS! WE HAVE A JET ENGINE!!!" "What are you going to do with it?" That has been the number one question since we popped the crate open. Well, let's just start with what it is. Currently, I have the engine and the original controller. The controller is what some might call dated. Also, I don't have any of the original cables. If you have worked around aircraft or military hardware, you can see how that will get expensive quick. The connectors used on this hardware can range from $30-$200 per cable end. One great aspect is that the manual for this engine is in the public domain. It was tricky to track down but there are military enthusiasts who scan field manuals for release. From the 300+ pages, I have been able to understand how it is wired, plumbed, and how to service every component. I am impressed by how detailed and thorough it is. There are diagrams for every subsystem. One of my favorites is the simple engine oil flow diagram. With this information I am going to use an Arduino to monitor the speed, temperature, and oil pressure while controlling the fuel flow to the engine. 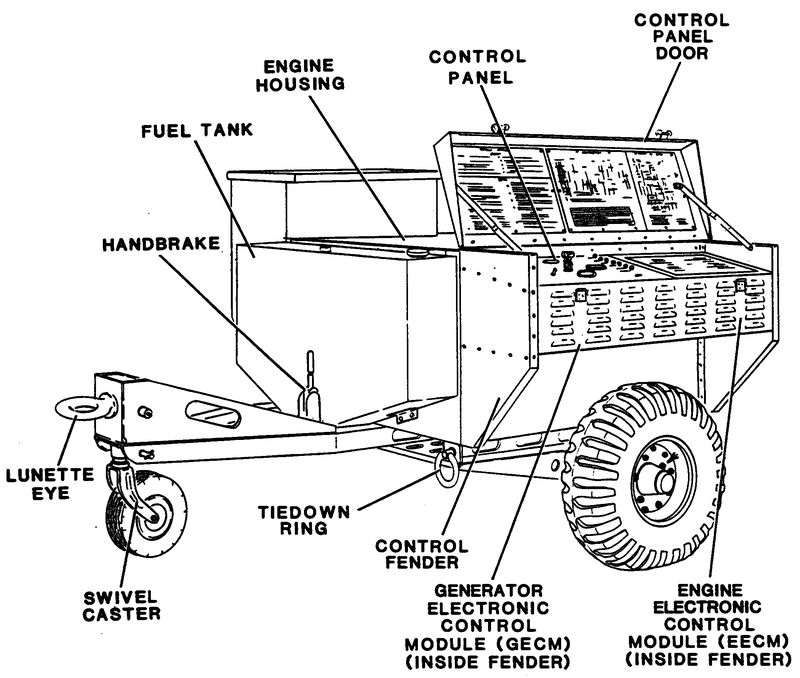 The current engine controller would require quite a bit of hacking to allow it to operate without a generator attached. By using an Arduino, I can play with settings and possibly enable some speed control. That's where things get interesting. "But, what are you going to do with it?" This is the second most asked question. Besides getting it to start off a custom controller, I'm not quite sure. The engine has a lovely output shaft that is designed to spin at about 12k rpm (revolutions per minute). 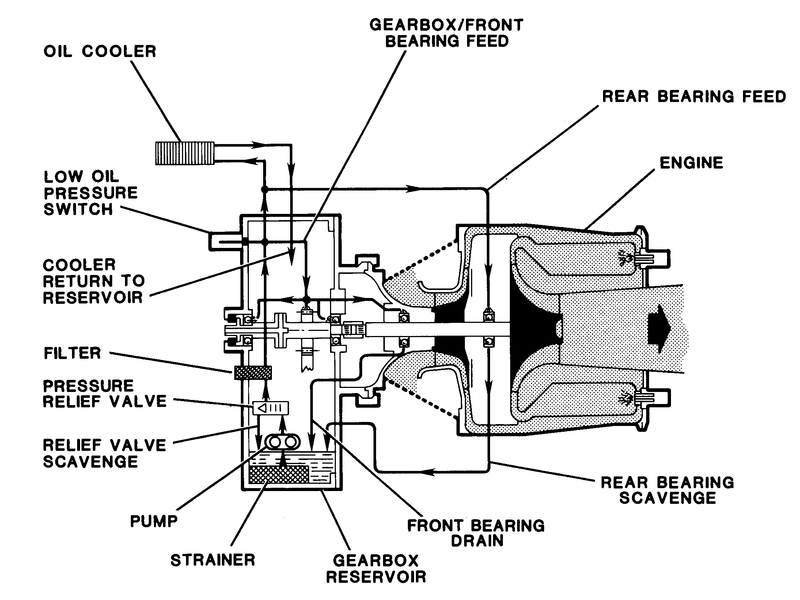 The shaft is connected to an internal 4:1 gear reduction. So, that means the turbine is spinning at about 48k rpm. That's pretty quick considering most automobile engines "redline" between 6-9k rpm. The difficulty will be finding some way to connect to the output shaft and keep it from flying apart. There is a nice bolt pattern that can be used to hold a secondary gearbox. Adding one would require some considerable engineering to prove something built would stand up to the speed and power associated. The true output power is not documented in the manual. The engine is rated for 10kw of electrical power. There are forums that boast anywhere from 75-150hp. There are similar engines that powered a small, single seat helicopter. I think until it is running the question will remain un-answered, although ideas for go-karts, jet-boats, and hovercrafts have been tossed around. 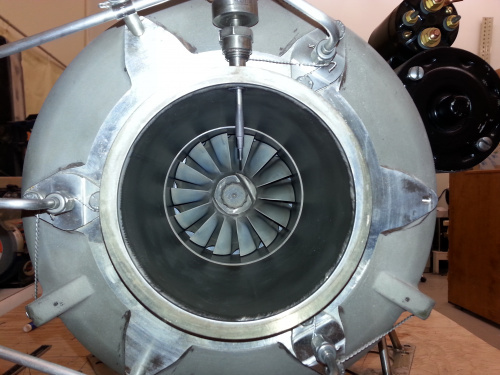 What would you build if you had a jet engine? Personally, I'd probably build a safety enclosure. get 3 more and make an extreamly cool quad copter. It wasn't that long ago that we had Nick W. using some kind of gas combustion chamber to drive Nerf darts. It turns out that beyond a certain point they just kind of disintegrate. Obviously then it's time to upgrade to darts. Indeed, I've done that with compressed air. Is there a way to downvote comments yet? And other times we just share animated gifs on IRC and laugh. Makes up for the time we write code and cry. This thread is why I like shopping at Sparkfun... The folks behind your order, folks. That would make for some lengthy tool changes. Psh, just don't do direct-drive. Mount it off the back of the column and use a belt-drive. want. If you have any questions regarding the gas turbine governor please drop me an email. I write turbine control system logic for a living (governing and sequencing). There is only one possible use. 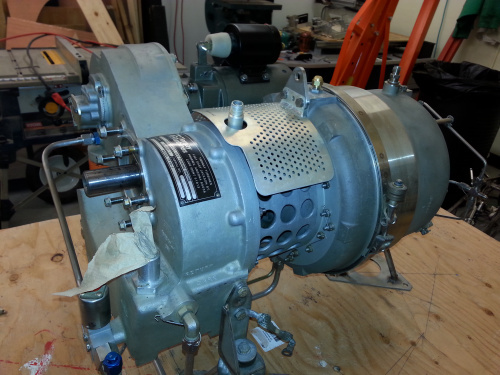 A jet powered air raid siren! the ultimate two-man fence post auger..
What you really want to worry about is when the ignition module FAILS to contain that lethal energy! I want a job at Sparkfun. Bring it to SXSW. Should work flawlessly as an e-textile jet pack. Finally a paper shredder you can put staples through! "ideas for go-karts, jet-boats, and hovercrafts have been tossed around": using a jet engine for a land vehicle? Sounds like an old Darwin Award story. Well, Evel Knievel has been a role model for me. There have been been lots of successful land vehicles using (far bigger) gas turbines, it's definitely what I'd use it for. Like the M1 Abrams, for example. The turbine in the M1 is MUCH bigger. Like 1500shp. Edit: Here we go. Pretty close to the version I remember, anyway. 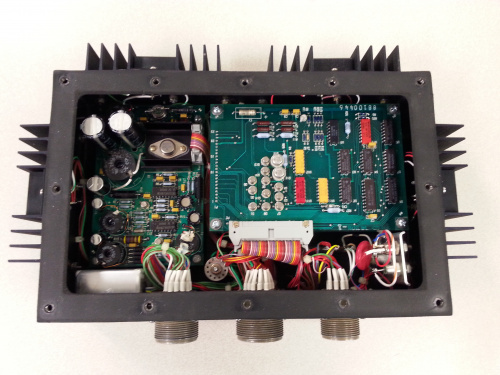 Use a generator and output the power to two motors, one for each track of a form of ATV. I'd put it a Ford Mustang. Add both a Turbo and Super Charger if possible. Take it to the nearest car show. Hook a wok to the output shaft. Heat up the oil internally and cycle into the wok. This would be the ultimate in stir fry. 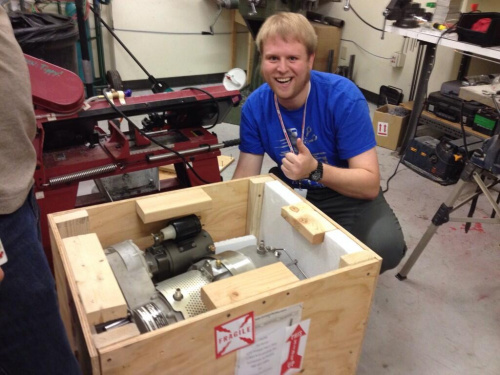 I happen to be an engineer whose specialty is high speed turbine powered gearboxes! I work at a company that designs and manufactures machines that test helicopter transmissions so this is my bread and butter. I would be more than happy to help SFE come up with something to transmit the power from that bad boy. Shoot me an email! 12K rpm of ideally constant RPM.... That is darn fast for most industrial systems (most normal bearings are rated to 6Krpm max), so you're not going to get too far away from aerospace parts until you slow that thing down, probably 3:1 minimum. Just remember, belts do not like spinning anywhere near this speed, so any belt drive will either disintegrate or try and do an impersonation of a perfect circle then disintegrate at the current output shaft speed (remember your maximum FPM). Also, I really don't think your average snow mobile drive train could handle this speed. And it's only 15hp from your other conversations. Well, it's interesting to see how a small portion the Sparkfun overhead is indirectly expended. An impractical use for this may be to power an oversized and obnoxiously loud leaf blower. However, I suspect the only likely practical applications relate to using with a generator (as it was designed and built for). I'm not a gas turbine expert, but I do have a commercial pilot rating for turboprop airplanes and turboshaft helicopters. The operation of gas turbine engines is generally limited to a range of high RPMs were the Brayton cycle can be maintained and managed. The gas turbines of turboprops and turboshafts often have centrifugal and axial stages along with a separate power turbine/section(Np) that is connected to the gear box for propulsion/lift. This allows the gas turbine section(Ng) to better establish and maintain combustion independent of the mechanical load. The Ng and Np sections rotate independently on concentric shafts. Also, many large aircraft have on-board APUs for start-up/backup power. This gas turbine appears to be a single shaft with a combined gas/power function. As such, the stability of the output RPM greatly affects the stability of the combustion. Use with a generator would allow the engine to be brought to speed with little load and then for some control of the load placed on it. Any other application with significant initial or irregular loads could be highly problematic. Good luck with the endeavor â If you haven't done so already, you may want find a similar jet turbine ground power unit in use someplace. Additionally, inspection and maintenance of gas turbines can require specialized training and tools. More generic term would be turboshaft. But anyways, is the 12k rpm at optimal speed? I'm guessing idle is lower? It depends on how slow the output shaft spins at its lowest possible idle, but you might be able to use the stock torque converter. If it idles too high (1500rpm or higher), you could just replace the stock torque converter with a drag racing torque converter with a higher stall RPM rating. Drag cars often have huge cams with really good top end power, while sacrificing power in the low end. (which is what makes them idle so roughly) To avoid a rocky start in the low RPM's where the motor doesn't run well, they run torque converters that don't start transferring power until a higher RPM, like 2500 RPM's, for example. Something like that could potentially work well in your case. 12k rpm at the top end shouldn't be a problem at all. You'd just want a shorter final output. 4.60 gearing in the rear end would probably be optimal for a top RPM of 12k. What comes to mind? BATMOBILE. Nuff said. Make it happen guys. If you mounted it at the rear of the car, you could even use a fuel pump to dump fuel into the exhaust section with an ignitor for an "afterburner". It would be for looks over function, obviously. But you know what? This is sparkfun. Home of ELECTRONICS. Going mechanical would make sense for this engine, but I think hybrid drive would be cooler. Like how diesel trains work. Huge diesel motors that drive generators that then power torquey electric motors that power the wheels. They're VERY efficient. I imagine a gas turbine is probably nearly as efficient, if not more efficient, at its peak. Have it power a generator/alternator, then charge a battery bank an/or power an electric motor to drive the wheel(s). Possibilities are endless. Gas turbines are exciting. I have no use for one but I want one. Something fierce. Don't ask me why, but I use to have a bad habit of collecting aircraft alternators... I had a couple dozen of them. The only two non-military ones I had were from a 737. Are you willing to provide a link to the manual you found for this engine? I'm too lazy to look it up myself, but if you do, I'll take a look to see if I ever had any alternators that bolt up to your engine. If I did use to own one, I know who owns them now and he may be willing to part with it. And it won't cost much; I sold them to him at pretty much scrap value (I needed the room for more hording :-) A bit of trivia; the air craft alternator shafts have a narrowed down portion to act as a mechanical fuse. If something shorted out the alternator, you don't want it to kill your engine and take down the plane. While typical automobile engine crankshafts might redline at 6-9K RPM, the turbines in typical automobile turbochargers spin at around 100K RPM or higher. Garrett's smallest turbo spins at 240K RPM. Piston engines can't handle much higher crankshaft speeds because of the mechanical and thermal stresses it places on the connecting rods, pistons, bearings, and cylinders. Obviously, though, 12K on the output shaft is a lot to deal with and I think that's what you are trying to get at. A swamp boat, Overcraft or something in between. DO you have the pin out for the cable connections looks like 3 custom cables with many pins. What would I build wow I have no idea but exploring and learning from this thing is well worth what ever you paid for it. Just a couple of comments if you are looking at tweaking the controller board.... Mil spec stuff tends to have a sprayed on plastic coating to ensure moisture does not interfere with the PCB or bridge contacts during opperation.This may give off a very nasty gas if you heat it too much. The solder is likely to be leaded because even some of the modern military stuff is allowed to be depending on usage due to the tin whisker problem amungst other things. If you are going to be driving something with this engine beware of the balance of the shaft you connect to it, at high revs even a little impalance can destroy bearings and anything else connected. There is a possibility that I may be able to find those connectors, but for your purposes, it might be better to just rewire them to something easier to find. "If you have worked around aircraft or military hardware.."
Lighter than air-craft!!! Build a frame with a hydrogen pocket. Mount this bad boy vertically with a large prop. I'm not sure how you are going to fuel this monster but if you could build a proof of concept lighter than air car, even if it only flew for a Wright brothers length flight, would be awesome. Gear Reduction? More teeth on the primary means it could spin slower and turn the output faster. So at 12k rpm on the output wouldn't that imply 3k rpm internally? If the turbine had less teeth then the output then it would need to spin at 48k rpm to create the 12k rpm. This is 4:1 Primary to Secondary or Driver to Driven right because if it is then the math must be wrong. While sticking this thing in a Prius would be the ultimate thumb-nose to the enviro-loons, I reckon the best application would be to a stonkin' four (or six) wheel drive. The gearbox would certainly be a great challenge! I'm kind of a wood guy, so I would probably find out some way to put it on a portable sawmill. Whackin and Stackin! There's a reason that you don't typically see turbines used outside aviation (high power/weight ratio), power generation, and ....and.... I got nothing else. Quad-copter, 4 fans running on power generated from one power generator. Two seater, of course. -CHAINSAW! -Exo Suit: Use the turbine to run a hydraulic pump to make a "power pack". -Scale model of an M1A2 Abrams tank with air powered t-shirt gun in the turret. -CHAINSAW! -CHAINSAW! What would you build if you had a jet engine? ........A Jet! This needs to power the weapon on a BattleBot! I met a gentleman that built turbine controls for model aircraft and drones that used a Microchip dsPIC30. Turbines are amazing, remember to keep the control loop very quick- things can go very badly very quickly, it would be a shame to see this destroyed by a momentary lean condition. I am clearly quite envious that I missed this auction- may I ask what it runs for (the turbine sans generator)? Oh and price, you're going to look at between $3-5k depending on quality and documentation. Anything bigger, add a zero. It is a concern of mine. The original controller is an 8051 based micro running at 8mhz. I'm hoping that 16mhz with a pro-mini would suffice, but I have an STM32 board ready to take over. How about a watchdog MCU? in the loop. They're cheap and turbines are expensive! For the gearheads in the group, check out this guy on the 'tubes for more jet pr0n. I actually reached out to him for advice but I got no reply :( I learned about control wire from his vids. Awesome stuff. I want to know where he gets his engines. Those little T58s in his jetboat are awesome, I want one. I think the attribute defining the utility will be in the power/weight ratio. Get it running with your new controllers, see if you can dyno it in some wonky way, and then figure out the application based on what it realistically can do. Multimachine. Adding CNC capabiliies via microcontroller or development board of course. Or some kind of universal adapter/mechanical power transfer to drive every tool in the shop, simultaneously. edit* I realize that is what electricity does, but it's just not as cool. A 150HP Dremel, Oh yeah! I think I would go for a Series Hybrid Car. I can't imagine the quality of the gearbox you will need to take power at 12k rpm, but you might get a flat belt to couple it to a DC generator and charge your car batteries. A small car only needs about 15 horsepower to cruise down the highway and the batteries can give you the power you need to accelerate. I would figure out if the thing is energy efficient first. How about using it to power the compressor stage for a real (axial) turbojet so you can actually get thrust ? If anything I would look into powering a large duct fan. Something like this looks interesting. Do you have the power curve for this unit? From what I remember from my turbine lab in college (working with a helicopter APU) you need a pretty serious starter motor for a turbine, and they really want to run over a small speed range. My car engine runs happily from 2-6k RPM, but if your turbine probably has a range of something like 46-50k, and might not even produce enough power to keep itself running until 30k or so. And I am sure the manual says JP-8, but pretty much anything that burns should work. I would start with kerosine if you don't want to drag gas cans to the airport. Some people say they aren't efficient, but they are just thinking about it wrong. Their fuel efficiency might be low, but their volumetric efficiency is great! Does anyone know if a Tesla, or a Prius will let you charge while driving? So far as horsepower goes, 10kw -> ~13.5 hp. The conversion is about 743 watts per hp. Don't fuss too much about the last couple of figures. I've seen a variety of conversion numbers around 750 watts. So, given generator losses, shaft horsepower will be in the close neighborhood 15 hp. Another useful way to get a ballpark figure for horsepower is to use around a third of a pound of fuel per horsepower hour. This works for piston engines, no real guess as to what this little turbine might do. 10kw -> ~350 amps at 28 volts. It would power a pretty honky stick arc welder, burn 3/8 rod at least. That might be where the 150hp number came from. The engine consumes about 23.6kg/hr or roughly 51.92 lbs/hr. Multiply that by 3 and you get about 150. I haven been also trying to determine power numbers by using some standard jet engine power calculations, Fuel + Air burned multiplied by the velocity of the exhaust. It is proving difficult because that is generally used for axial flow turbines. LAME!!!! It isn't even powered by an Arduino or Raspberry pi! When I started reading this article, I couldn't help but think about trolling and writing a comment like, "Hey can you post an arduino pinout and sample code?" Imagine my surprise when I later found out that will most likely be in the followup. I have always wanted to use a turbine power unit like this to power a motorcycle. I know it would not be the fastest thing around, but how many tubine bikes are out there. The output shaft would be perfect to couple it with a harley transmission and there you go. I'd be inclined to do something similar to it's original purpose -- only with 12V DC and/or 120/240V AC output. 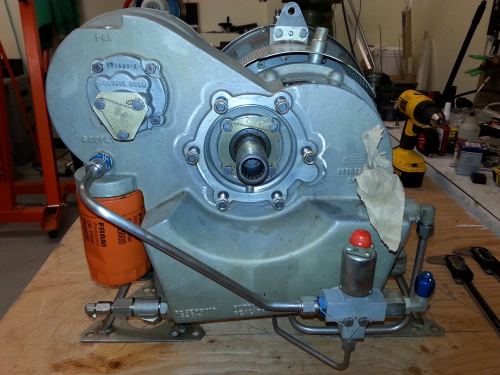 (Look for a generator for a tractor PTO [Power Take Off] -- though you'll have to gear it down to, IIRC, 600 RPM. I've seen them in roughly the 10KW range.) I'm into ham radio -- this would be a fantastic addition to Field Day -- enough power to run an A/C unit as well as the radios. Might have to still run the radios on the trolling battery to get the points, but the A/C unit sure makes it a lot more pleasant! You can still find these with their original generators attached. I have seen them used for exactly that purpose. Knowing that, what would you make if you were not allowed to use it for it's intended purpose? OK, if I can't use it for a generator, how about converting my lawn tractor? FWIW, about 16 years ago I was out mowing the lawn and started to hear a strange noise for the mower to be making, and it was getting louder. I happened to look up and one of the Blue Angels was about a half mile away (practicing for a show the next day) -- I was relieved that it wasn't something bizzare with my riding mower. Converting it to this engine would likely make the mower sound similar to what I was hearing in that day!